Embody the trickster of Commedia dell’Arte with the Capitano Dritto - Carnival Design Curved Long Nose Mask. This type of Zanni mask is best known for its most prominent feature; a long crooked nose. Our Capitano Dritto Venetian masks create the comic relief every masquerade ball needs. These masquerade masks are hand painted with prominent colors in Venice, Italy. 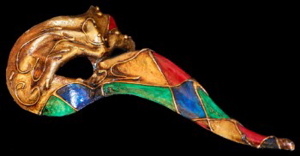 The long curved nose features a harlequin pattern of red, green, gold, blue and purple outlined in gold paint, while the upper portion of the eye mask has a furrowed brow in brilliant gold. Each of our masquerade masks includes satin ribbons for tying to create a secure fit at your upcoming event. 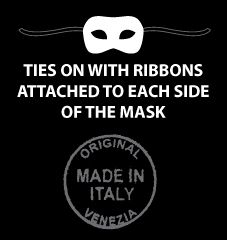 Add a plush gold, red, or blue hooded cloak made by Venetian Mask Society to complete your masquerade costume.